CDR Technical Services Ltd offers an extensive range of Robertshaw Thermocouples & Thermopiles. 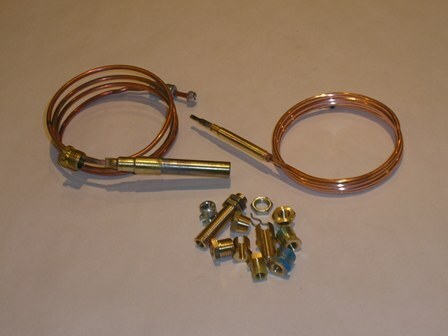 A Thermocouple is a safety device and consists of two metals, namely copper and steel. When heat is applied to the sensor, a small electrical charge is generated. The charge generated is expressed in millivolts (One millivolt is 1/1000th of a volt). A Thermopiles or pilot generator is nothing more than many thermocouples assembled together to increase the millivolt output. 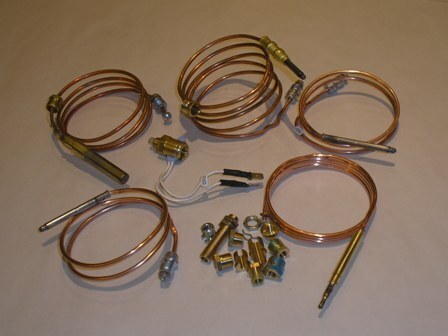 Thermopile have two types of connection, coaxial with male nut and two wire. All Thermocouples and Thermopiles designed and manufactured by Robertshaw are produced to a very high quality. 2C Models: are a Snap-Fit type and offer easy instalation into the majority of pilot burners, if used with a brass sheath they have added insulation from high temperatures when needed, they are made from the same materials as the 3C models..
3C Models: these are 20 to 30 millivolts 1970 series Is a unique design which allows easy installation into virtually all pilot burners, the stainless steel tip (longer life ), extended cold junction (greater voltage output potential ) these thermocouples are supplied with a lock washer which resists loosening due to vibration or changes in ambient temperatures, and makes it the most versatile thermocouple today. T-46 Models: All lengths are supplied with a threaded nut attached and are the same specification as the 2 C and 3C thermocouples.